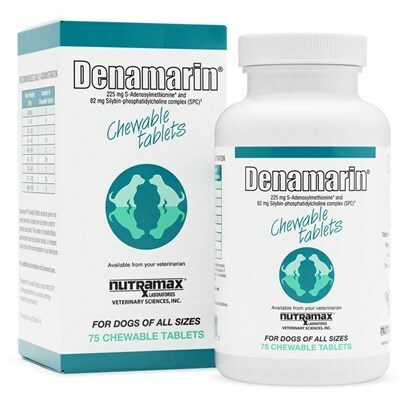 Denamarin for dogs is a chewable tablet that supports and protects the health of your pet's liver and is the number one veterinarian-recommended liver support brand. Denamarin is a nutritional supplement containing Silybin, an antioxidant that improves liver function by increasing liver glutathione levels which also helps with cell repair and regeneration, protecting some liver cells from cell death. There have been no reported side effects for Denamarin for dogs or cats. Denamarin Chewable Tablets should be given on an empty stomach, at least one hour before a meal for optimal absorption. The recommended dosage is based on weight but varies according to the direction of a veterinarian. 1/4 tablet for up to 6 lbs. 1/2 tablet for 7-15 lbs. 1 tablet for more than 16-30 lbs. 1 and a 1/2 tablets for 31-45 lbs. 2 tablets for 46-60 lbs. 2 and a 1/2 tablets for 61-75 lbs. 3 tablets for 76-90 lbs. 3 and a half tablets for 91-105 lbs. 4 tablets for over 105 lbs.